Large evolved planetaries have this special nimbus: very large, extremely faint and at the border of or beyond visibility. 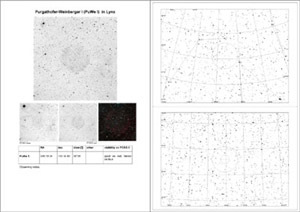 In contrast to other large and faint objects, such as for instance certain dwarf galaxies, PN are line emitters. This considerably increases the chances of visibility with a telescope. Using OIII, UHC, or in certain cases H beta emission line filters, some of these large PN come well within reach of visual observation. 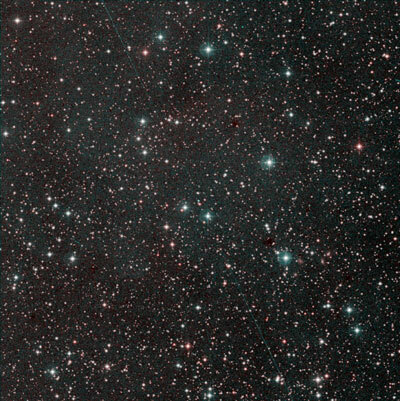 Even some of those PN, that are hardly visible on the deep plates of the Palomar Sky survey, are well within reach for visual observation with amateur telescopes. 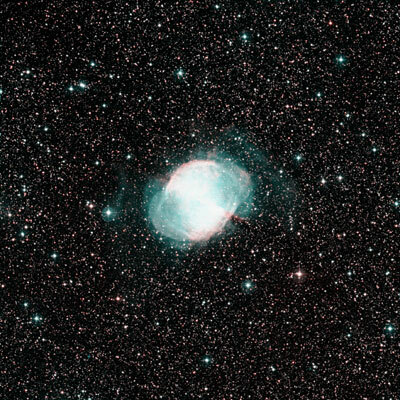 However, apart of few brighter PN, such as the Dumbbell nebula, Abell 21 or the Helix nebula, most of these large PN require a very dark and transparent sky to be able to discern the often only minimal contrast to the background. 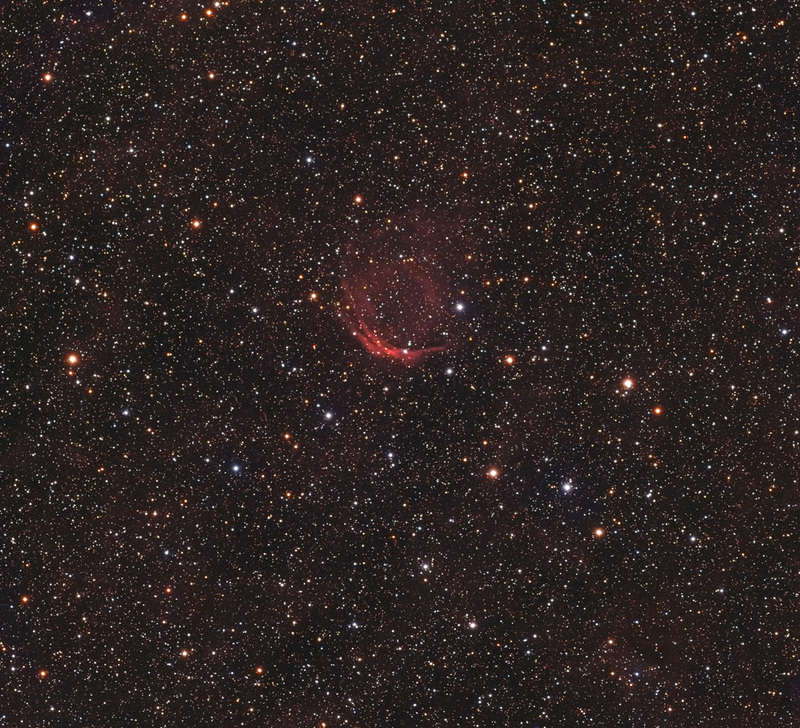 In young PN, the central star is usually properly in the middle of its PN shell. This is not necessarily the case with older, evolved PN. 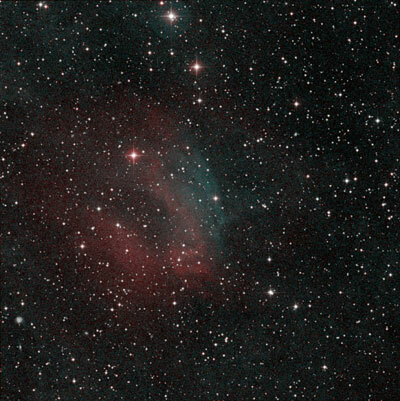 If the PN's progenitor star has moved through space prior to becoming a PN, it will move on as well as a PN. At least as long as there is nothing in its way. 1) The movement of the PN shell through the ISM may lead to formation of a shock front in the direction of its movement. Quite distinct shock fronts can be found with HFG 1, PFP 1, or Abell 31 to name a few. 2) Further, the PN may loose behind material of the PN shell on its way trough the ISM, leading to formation of a weak "trail" behind the PN. Such trails are, for instance behind HFG 1 or Sharpless 68 (note that this is being questioned for the latter by David Frew, see below). 3) Due to this differential interaction and slow down of shell and star, the central star will no longer be in the middle of the PN shell, but rather be ahead of it. He is becoming a runway central star. 4) The latter leads to differential excitation of the shell. OIII emission (requiring higher energy of the ionizing radiation than HII emission) will be possible only in the vicinity of the hot central star, i.e. within the so-called OIII-Strömgren zone of the central star. HII emission, on the other hand, can still be emitted from the entire shell. 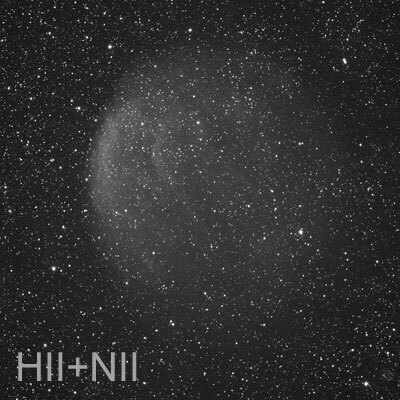 Due to this, OIII and HII images will show different areas of the PN shell, which are displaced relative to each other. In this displacement, the OIII areas will be ahead of the HII areas in the direction of the runaway central star. The displacement resulting from point 4 can be confirmed visually for some of the large PN, as for instance for DeHt 5 or Sharpless 68. 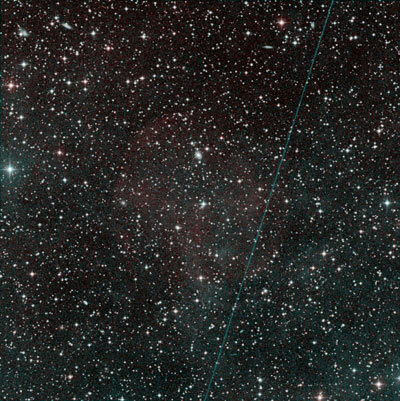 The most distinct displacement, however, can be observed for Sharpless 174 (see images to the right). It has to be noted, however, that the status of all three as true PN is being strongly questioned. Sharpless 174 has a size of 10'x15' and belongs hence to the largest of the presented objects. For this object, a large proper motion of the White Dwarf star relative to its shell or rather its ionized environment had been observed. 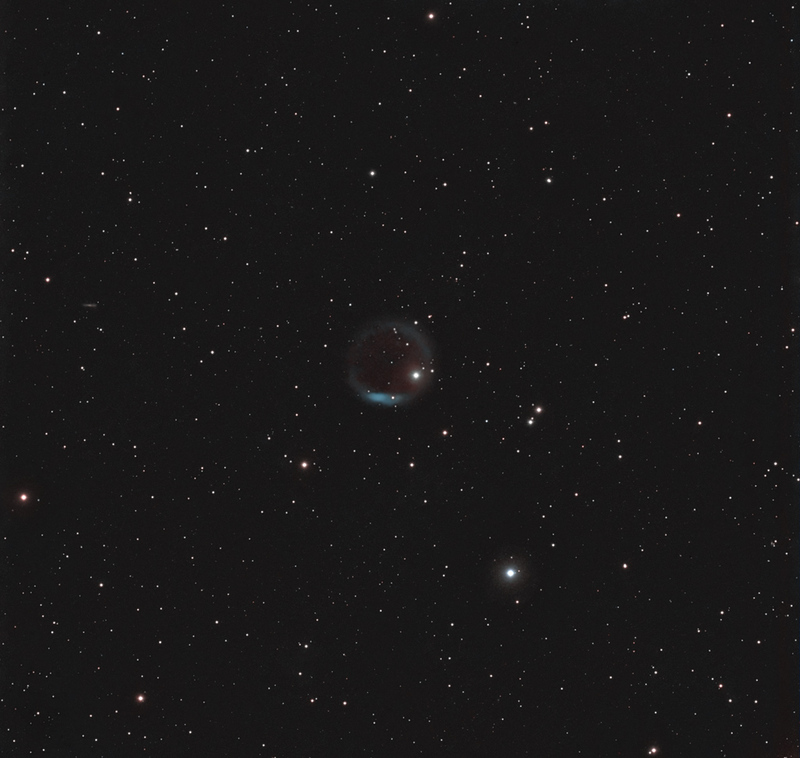 It has been initially conjectured, that on its way through the ISM, the putative PN shell forms a trail of HII emission behind it, which can be well discerned on this image by Don Goldman. The central star is already far away from the center of the HII emission. Due to this apparent lack of a central star, the object had been formerly classified as a HII region (which it likely is). The area shining in OIII light, however, is still placed concentrically around the hot central star, leading to a pronounced displacement between areas of HII and areas of OIII emission (see animation to the right). Exactly this situation can be confirmed at the eyepiece. 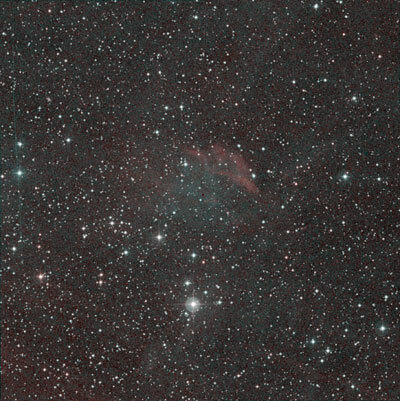 The nebula is very faint with only diffuse borders, but reveals a distinct displacement of the glowing spot upon switching from OIII to H beta filter. 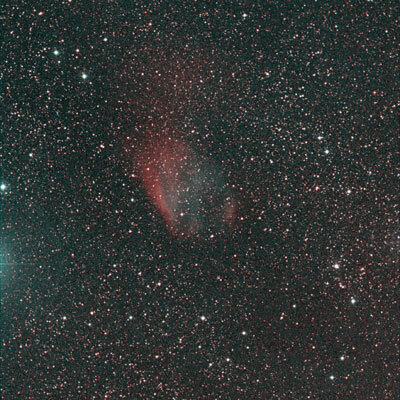 OIII emission is visible to the NE of the nebula, while H beta and hence HII emission is more extended in the SE part of the nebula. With a UHC filter, which transmits both OIII and H beta, both parts can be observed simultaneously, leading to a rather round appearance of the object. To be or not to be: Are these all true PN? 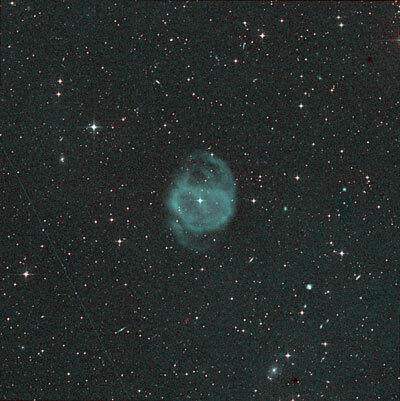 Due to the lack of a bow shock, preceding the motion of the "central star", and for several other reasons, the status of DeHt 5, Sharpless 68, Sharpless 174 and Abell 35 as true PN is being questioned by David Frew. He comes to the conclusion that all four objects represent ISM being ionized by the moving star and are hence Strömgren spheres rather than PN. The trailing HII regions or HII tails result then from the HII recombination time, which is rather long at the given density of the ISM. Further points put forward by Few are the age of the White Dwarf, which is in some cases far to old, the lack of a limb brightening typical of a PN shell, a too narrow line width for an expanding PN shell, and discrepancies between movement of the nebula and the White Dwarf. Besides try and error, comparison of the respective brightness of the PN on the POSS II blue and red plates can be helpful to judge the visibility of the PN in the visible range. The relative spectral sensitivity of our eye compares roughly to that of the POSS II blue plates, which are most sensitive in the range from 450 to 550 nm, while the red plates are sensitive in the range from 620 to 700 nm (the emulsions used for the POSS I survey, on the other hand, had a quite different spectral sensitivity ranging from 350 to 500 nm and from 620 to 670 nm, respectively). Note that some PN have their strongest emission in NII (655nm and 658nm). In those cases, a "bright" appearance on the red plates does not necessarily imply strong HII emission (in that case H-alpha at 656nm)! 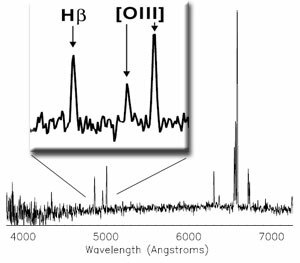 As most astro-imaging H-alpha filters (with the exemption of the very narrow 3nm filters) transmit not only H-alpha, but as well both NII lines, even most "H-alpha" images do not distinguish between HII and NII. For these planetaries, the OIII filter may be the filter of choice, even that the planetary appears deeply red on images, or an UHC filter (see here). The figures to the right show spectroscopic results by Pierce, Frew, and Parker for one of these large PN that emit mainly in NII, PFP 1. The upper panel shows the position of the slit of the spectrograph at the NE edge of the PN shell (as well as that of the control). The middle panel shows the spectrum for the visible range with the OIII line at 501nm and the H-beta line at und 486nm being of similar strength. 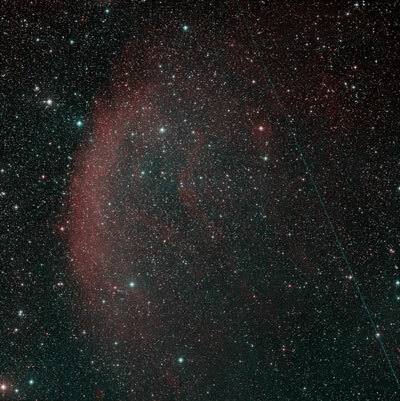 The lower panel is a close-up of the red range of the spectrum, where the NII lines clearly dominate over H-alpha. 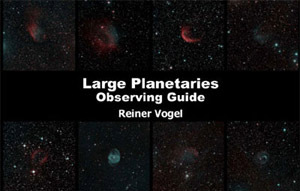 The observing atlas comprises a non-comprehensive list of 38 large PN (all larger than 5'), which are presented with DSS images, finder charts, and partly with descriptions of visual observations using my 22" Dob. The POSS II composites have a uniform size of 30'x30' (except for the largest members). For the faintest PN, there are also inverted renderings (mouseover). Below each description are links to excellent images. 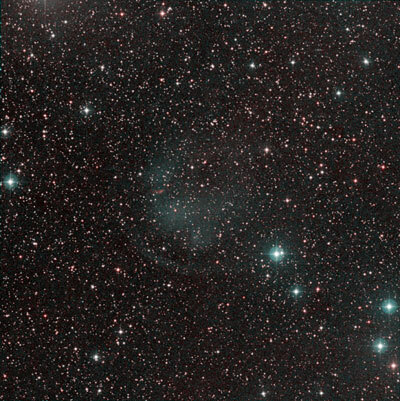 This is the largest of the known and confirmed PNs at a distance of about 400 - 600 LYs. The NE border is the region with highest contrast to the background. Can be scanned with the telescope and OIII filter. This PN can in fact become more difficult in larger scopes. 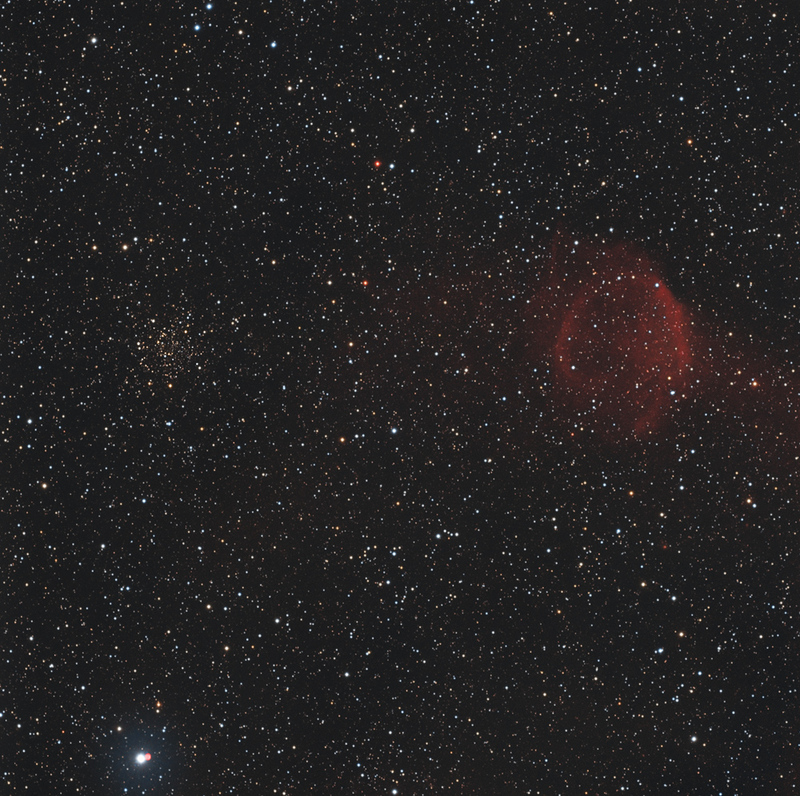 I have difficulty seeing it in my 22", but could clearly spot it with my 80 mm refractor (it's a matter of field). Note that the OIII region of the PN is smaller than HII and NII emitting regions, of which the NII images are the most structured. 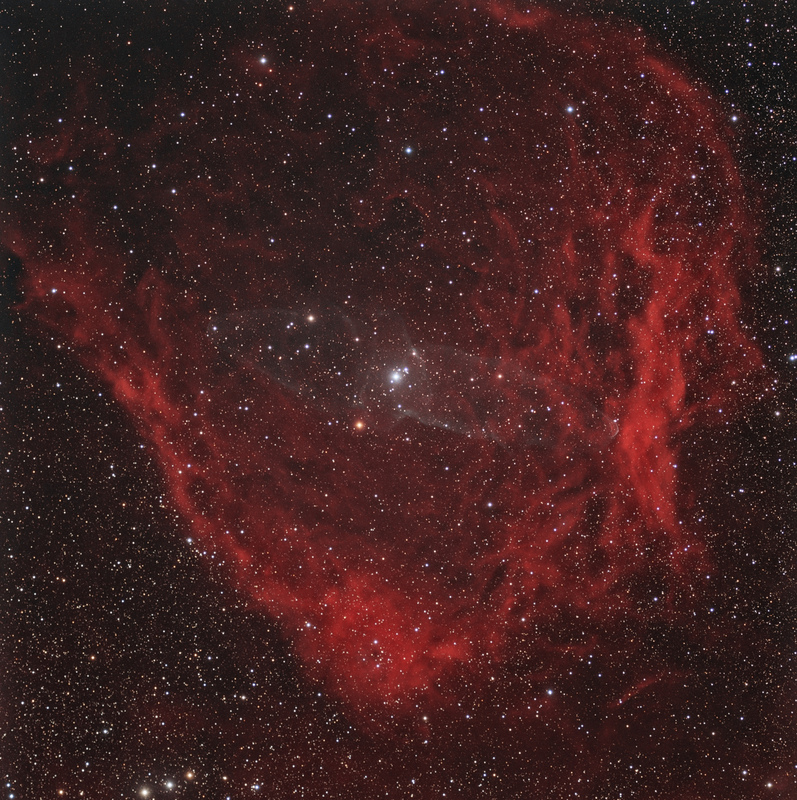 This is a spectacular new discovery be French amateur Nicolas Outters and was baptized Giant Squid Nebula. 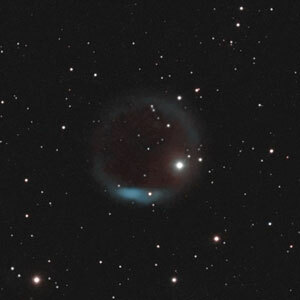 The nature of this predominantly OIII-emitting object is still unclear and it is presently considered a "possible planetary nebula". It might more likely be an outflow generated by a massive young star, HR8119, as suggested by Acker and co-workers. 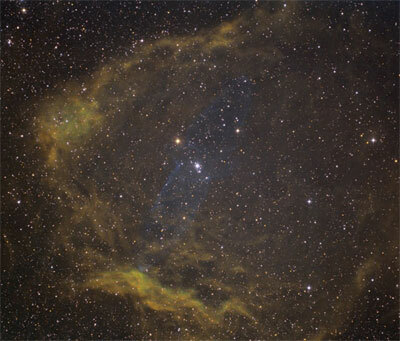 It is located apparently within the large HII shell of Sharpless 129. 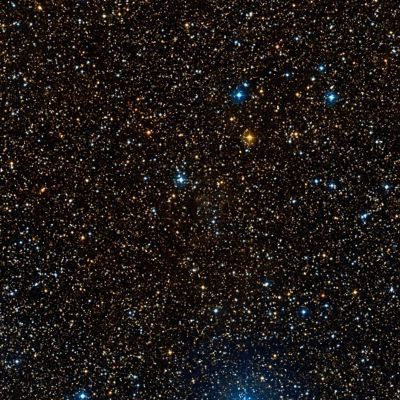 The bright star in the middle is probably not the true "central star", but far in the background. 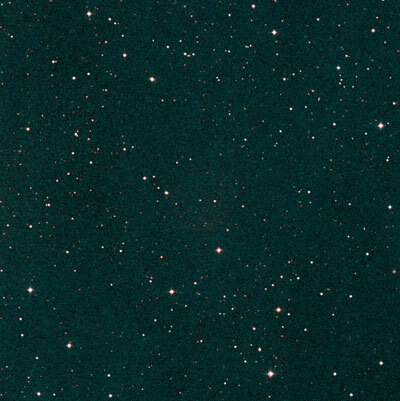 The distance of Ou 4 is estimated to be between 75 and 150 LY. 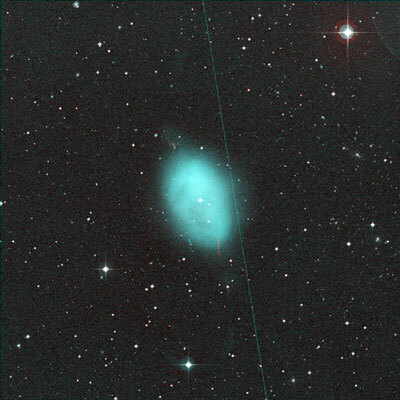 Ou 4 would therefore not only be one of the largest PN (69 arcminutes) but also probably the closest. With 7mm exit pupil and OIII, the brightest part at the NE side of the southern lobe was suspected, very doubtful. 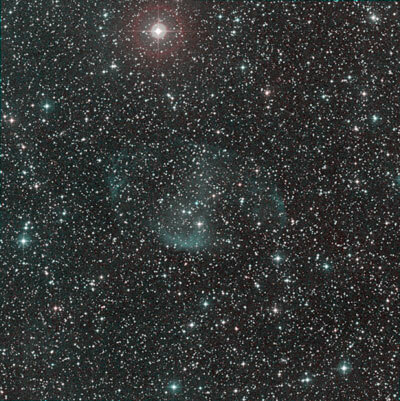 Tweedy-Kwitter 1 and 2 are extremely faint objects that were found during a search around potential central stars. The distance of TK2 is about 600 Lys. TK2 is possibly a Strömgren sphere and not a PN. 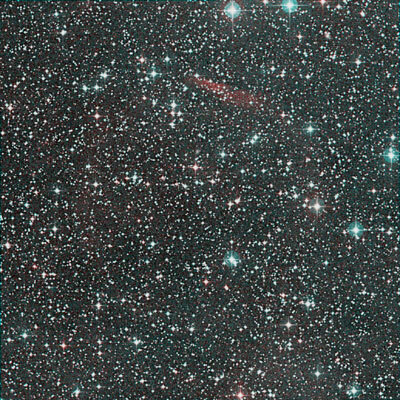 Tweedy-Kwitter 1 and 2 are extremely faint objects that were found during a search around potential central stars. The distance of TK1 is about 2000 Lys. Suspected with OIII as a round filled disk with defined borders towards N and W, more diffuse towards S. Unsafe observation. 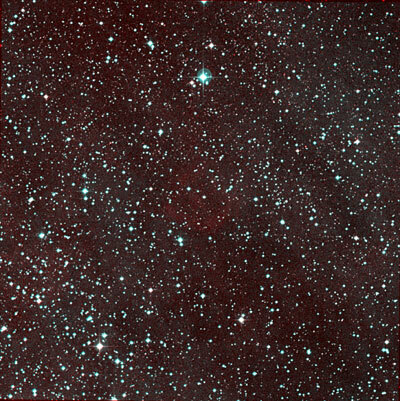 Red emission is mostly NII, which is about 4x stronger than HII (Frew 2013). The distance of this PN is about 3000 Lys. 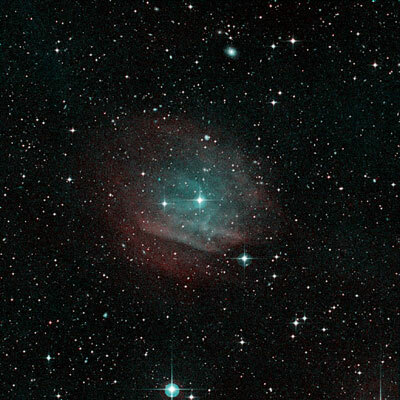 PuWe 1 (distance approximately 500-1300 LYs) appears under excellent conditions, minimal magnification, 7 mm exit pupil and OIII filter as an extremely faint disk with relatively well defined borders from SE to W (two prominent asterisms directly at the border). The PN responds similarly well to the UHC filter, with even better defined edges as compared with OIII. PN appears not ring or bubble shaped but as a full disk, that becomes dimmer toward NE. I had tried the "bright" filament at the N edge, which looks promising on broadband "H alpha" frames and which is due to interaction with the ISM. 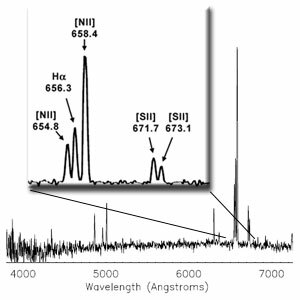 Most of the emission in the red spectral range is, however, due to NII and not HII. The H beta flux is therefore lower than that in OIII. OIII or UHC filters should therefore be better than a pure H beta filter. During my attempt to observe this segment at the N edge, the filament was at best "suspected". 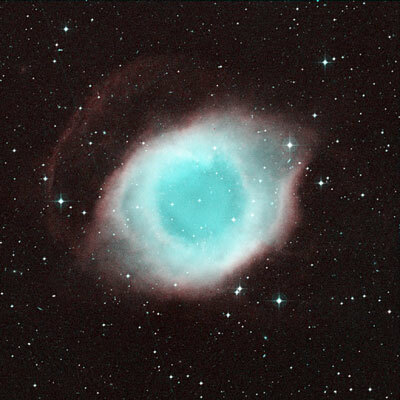 The Helix Nebula (distance 630 -1000 LYs) is shown here primarily to reveal the enormous differences in surface brightness to the other large PN. 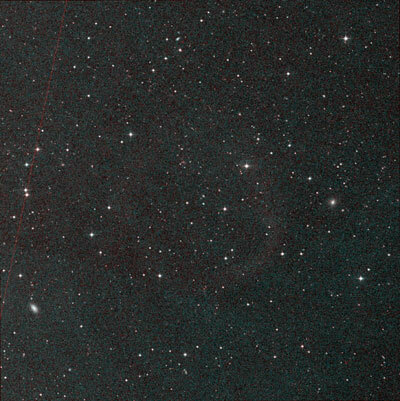 Most of those other large PN have a brightness comparable to the faint outer halo of the Helix rather than the PN itself. These outer halo shells are extremely faint and emit light predominantly in the NII lines (which makes visual detection even more difficult). I have tried to observed these outer halo shells several time, also under excellent alpine skies, but without definitely positive results. 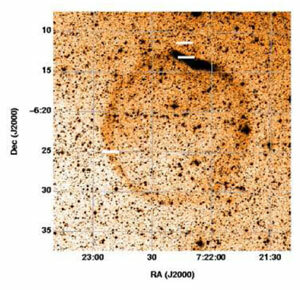 This is the largest Abell PN with a size of 17'x16' (of which, however, only the central part is visible) ! The distance of this PN is about 1400 Lys. Using OIII filter, Abell 31 is diffuse with no distinct boundaries. Internal structure is suspected but difficult to pin down. With 7mm exit pupil and H beta visible as a large, extremely faint glow. N and E side round, SW side not defined. The distance of this PN is about 2000 Lys. 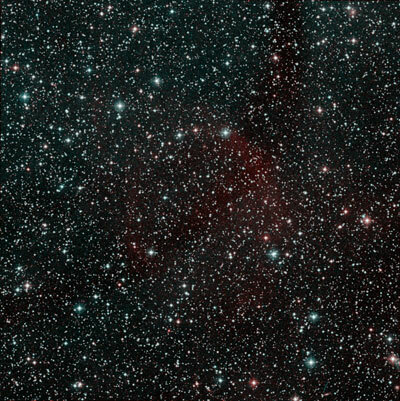 This is the second largest entry in Abell's catalog with 16'x11', of which again only the central part is visible. Its distance is about 700 Lys. 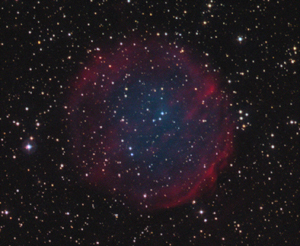 Abell 35 is likely a Strömgren sphere and not a true PN (Frew, thesis). 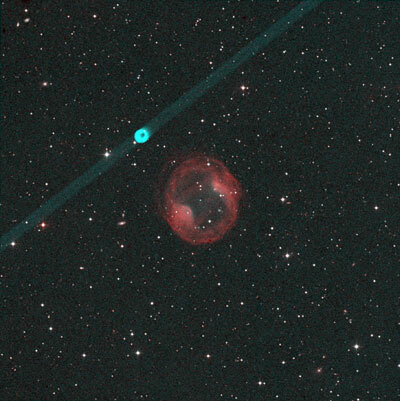 With OIII Filter, this object is immediately visible as a diffuse patch around a group of three stars. The band structure in the S part was suspected. 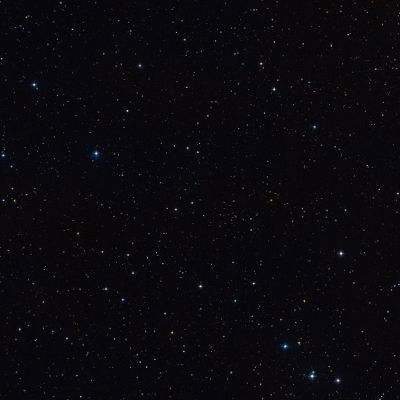 Distance of this object is about 500 LYs. 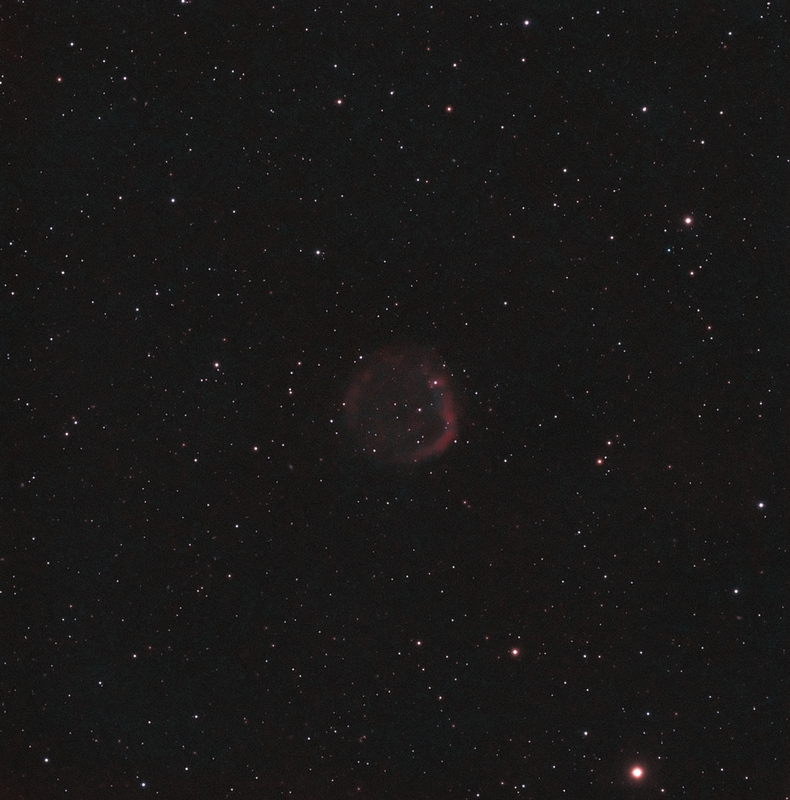 With OIII filter, this PN appears as a very faint, irregular diffuse glow. With 7mm exit pupil and UHC, the PN was visible as a large and extremely faint glow. Some parts of the edge were well defined. Distance of this PN is about 3000 Lys. Belongs to the club only because of its outer halo, which tremendously increases the overall size. The image is already quite burnt out, so this is many steps up from the other members. 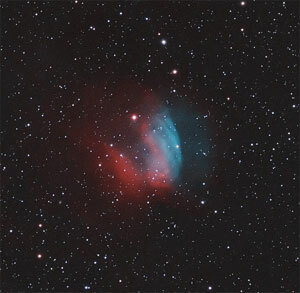 The outer halo, on the other hand, is again in the same ball park as the other large PN. Halo best with OIII filter at the sides with the "ears". 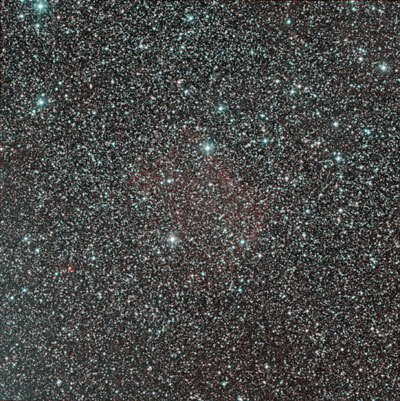 Appears as an extremely faint, large and diffuse patch N of a prominent asterism. OIII filter. 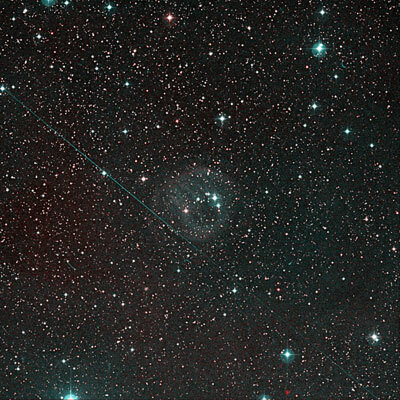 The distance of Abell 7 is about 1200 Ly. 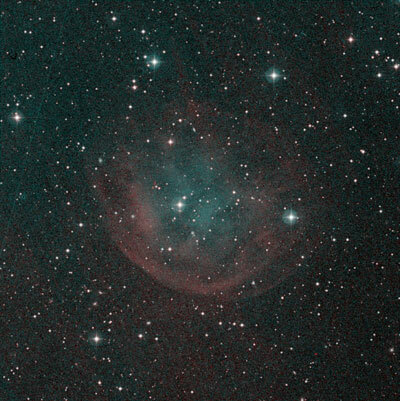 Observed several times with OIII, H beta and UHC filter, revealing different parts of the nebula, as evident from a slight shift upon OIII/H beta filter change. 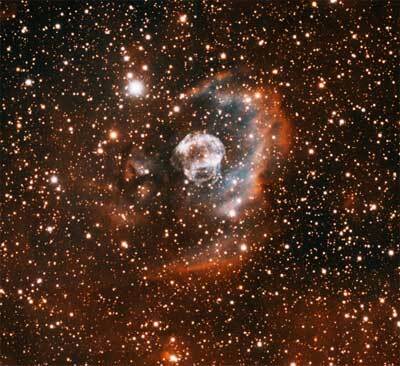 Nebula is diffuse with no clear boundaries. OIII emission is in the NW part. H beta emission is larger and in the SE part. 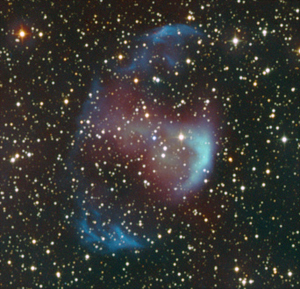 With UHC, both parts are visible and the nebula appears round. 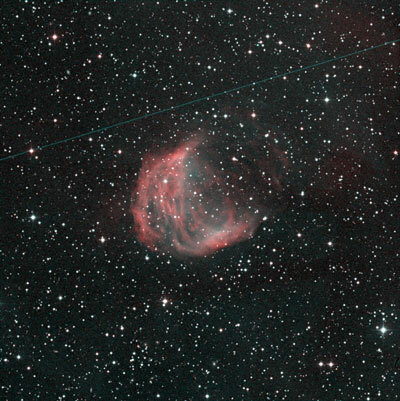 Sharpless 174 is likely a Strömgren sphere and not a true PN (Frew, thesis). Unsuccessful observation. According to Madsen et al., this PN has equal intensities in OIII and H-beta. 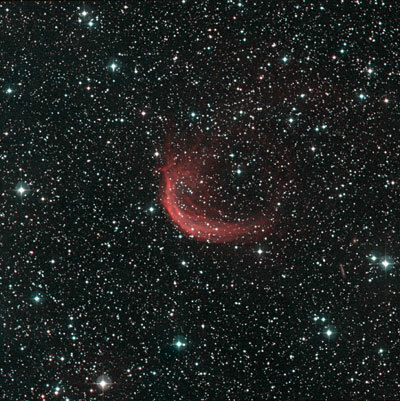 Relatively bright object with run-away CS. Appears as a faint patch with even surface brightness and diffuse boundaries. OIII filter. 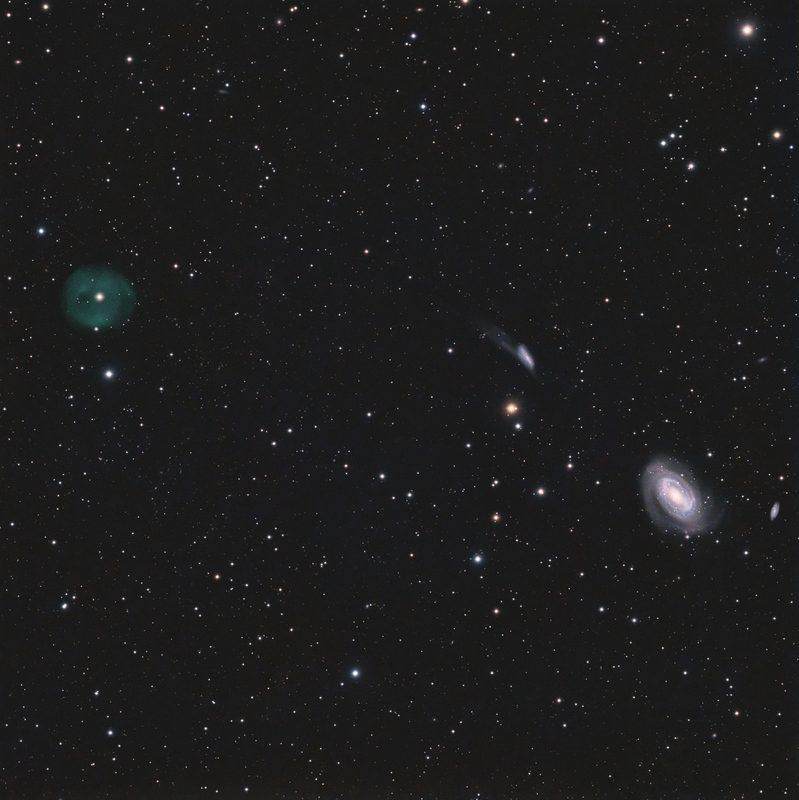 The faint emission N of the main body could not be observed (see Dean Salman's image at the top of this page). 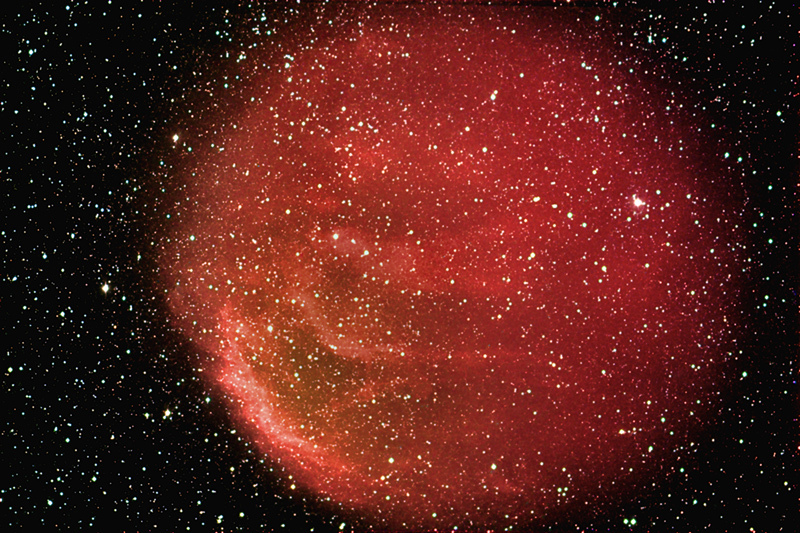 According to Frew (thesis), Sharpless 68 consists of ionized ISM and is not a true PN. NII is about 2.3-fold stronger than H-alpha. With 7mm exit pupil and with OIII filter, the PN could be observed as an extremely faint patch of light. It does not appear ring-shaped, but rather as a faintly glowing disk. The distance of EGB 6 is about 2000 Lys. 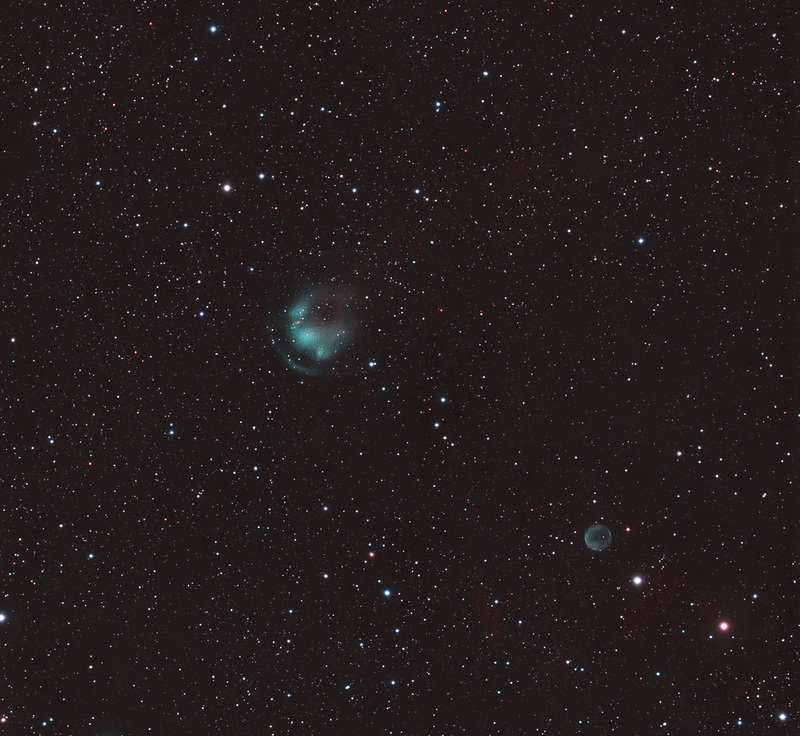 Using OIII filtering, the central southern part is visible as a diffuse, very faint and oval glow. Further OIII-bright patches at the E and W side can be observed as well, but are somewhat weaker (W side is the easier one). Relatively bright PN, responds well to OIII filter and shows its crescent shape and filamentary structure. Upon closer inspection, the PN is filled with fainter OIII emission. Even the NW border is visible as an extremely faint arc along an arc of stars. 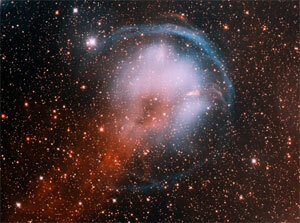 The distance of Abell 21 is about 2000 Ly. I tried this one several times and suspected under very good conditions part of the shell in the vicinity of the superimposed star over a bit more than 90°. The star was positioned within the shell. 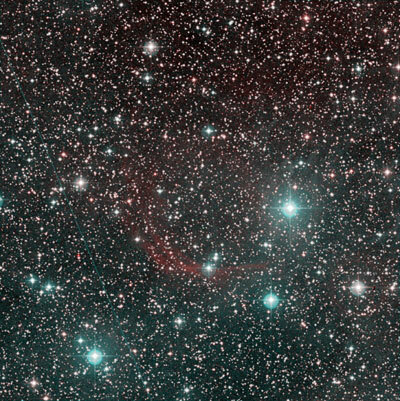 There are several faint stars superimposed along this stretch (visible and not visible at the eyepiece), which may be deceptive. 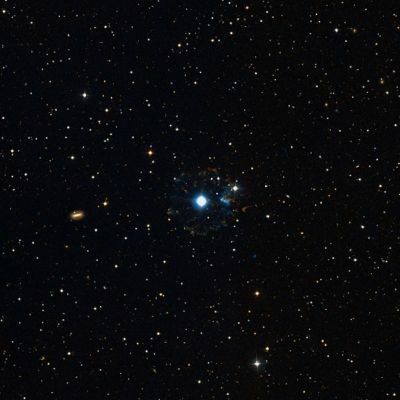 Extremely faint object bordered by two stars. SW section is better defined and roughly rectangular, NE section is larger and more diffuse. Responds best to UHC, but is also well visible with OIII and H-beta. NII is 4-fold stronger than H-alpha, OIII and H-beta have similar strength. 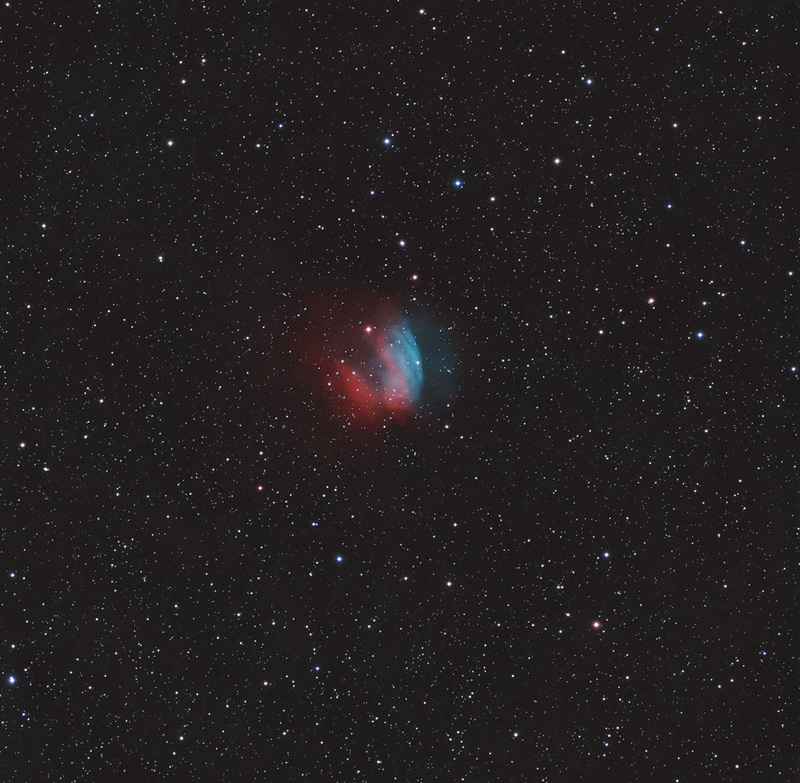 With OIII filter and 7mm exit pupil, an extremely faint large brightening was suspected. For this PN, OIII is stronger than H-alpha. Appears with OIII filter as an extremely faint, diffuse and round glow, that re-appears again and again upon field sweeping. The object appears not crescent shaped! DeHt 5 consists likely of ionized ISM and is not a true PN (Frew, thesis). Compared to many of the other, this is a relatively easy target (its very faint instead of extremely faint ) and could be observed several times. 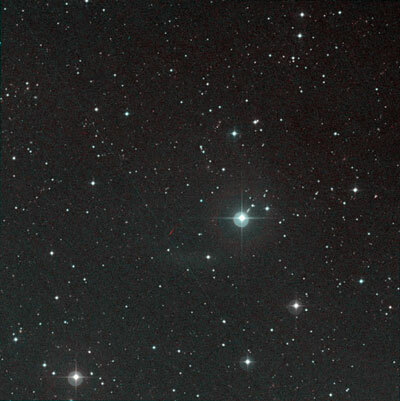 Faint disk with relatively well defined edge to the S at the position of the faint star in the middle between CS and the brighter star S. Visible with somewhat lower contrast also with UHC. Nice crescent. 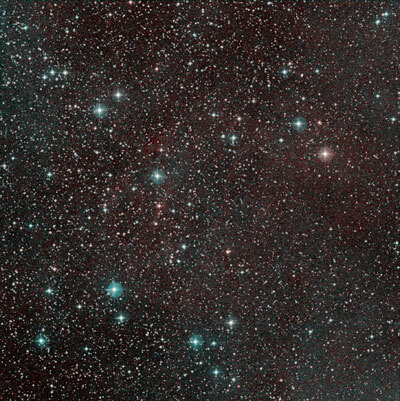 Like Abell 21 with a gray filter. Appears with OIII filter somewhat structured with hints of filaments. NII is for this PN 1.9-fold stronger than H-alpha. Bright PN with distinct central star. Responds well to OIII filtering. Oval shaped (N-S) with darker SE region. Truly belongs to the club only because of its outer halo, which tremendously increases the overall size . The image is already quite burnt out, so this is many steps up from the other members. 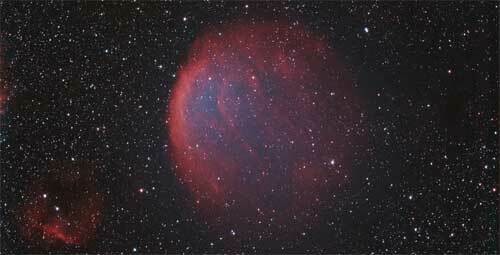 The outer halo, on the other hand, is again in the same ball park as the other large PN. Halo best with OIII filter at the sides with the "ears". 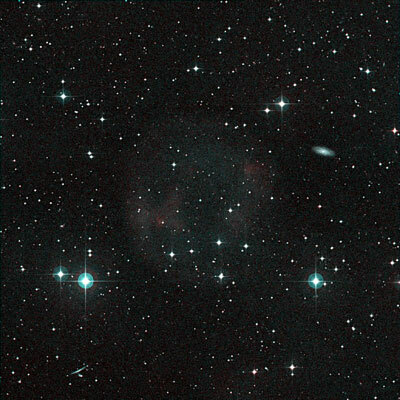 Another large and bright Abell PN with a diameter of roughly 8'. 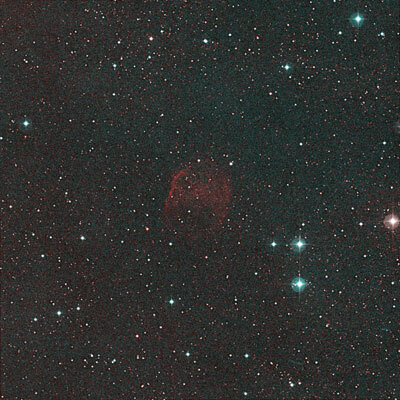 With OIII filter, this PN (distance 800 LYs) is quite distinctly visible around its central star. It appears slightly anular with darker center. With OIII filter, this PN does not appear crescent shaped, but rather as an extremely faint disk that pops up intermittently with indirect vision, corresponding to the slight white haze in the composite image. K 2-2 is stronger in OIII than in H-alpha. 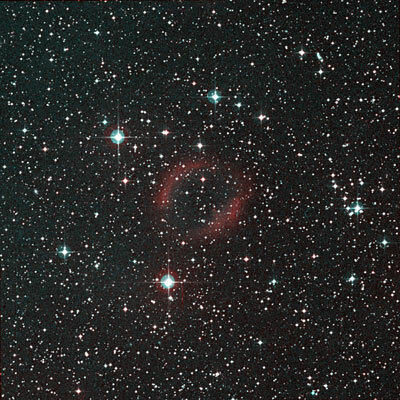 Relatively bright PN that appears as a ring with darker center. Ring has symmetrically two brighter and thicker parts at the NW and SE sides. 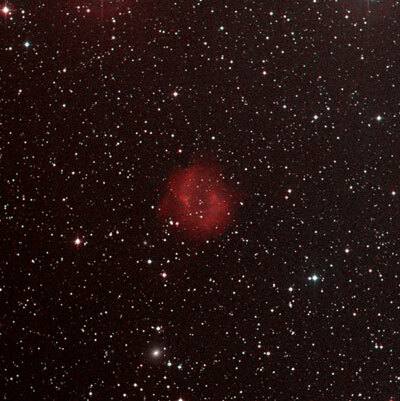 With OIII filter, a very faint glow was observed that extended well beyond the circular asterism in the center, in particular to the North side. Dean Salman and Jim Janusz detect a faint outer halo that span over almost 40'. This halo is already mentioned in the discovery paper, but appears to consist of ISM ionized by the central star, therefore not being a true part of the PN. Unsuccessful with all filters (as well as without filter) and 5-7mm exit pupil. According to Frew (thesis), the ratio NII/H-alpha of this PN is 3.0, implying that most of the red emission is NII and not HII. 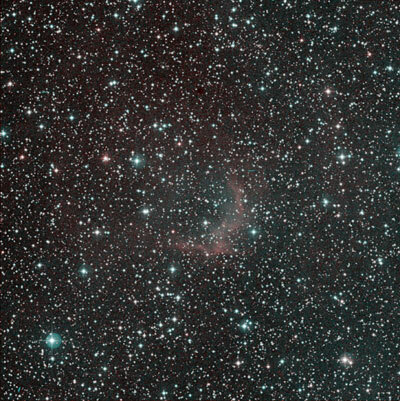 This PN was discovered in 2009 by the IPHAS Survey as IPHASX J205013.7 + 465518. 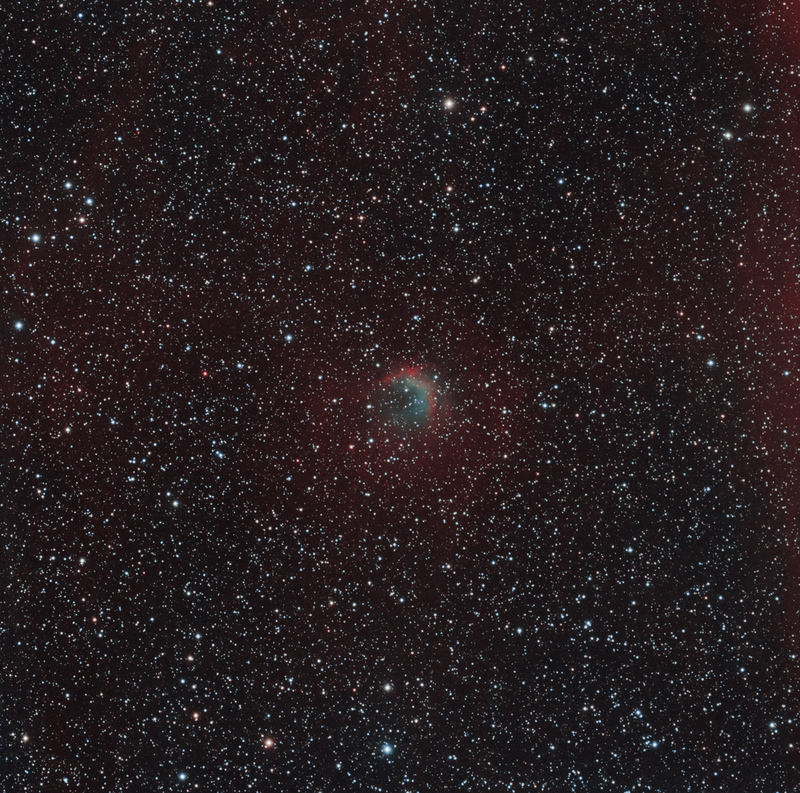 It is hardly visible on the DSS, but relatively bright in OIII, as evident from the fantastic image by Don Goldman. Best with 100x and 5.2mm exit pupil and with OIII filter. 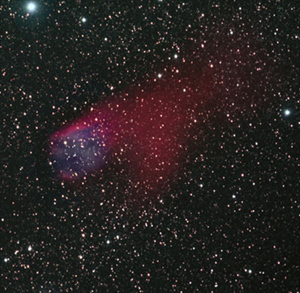 Appears as a large and extremely faint, structured brightening. N edge is round, S edge hardly defined. Central part better defined as NNE/SSW elongated bar. 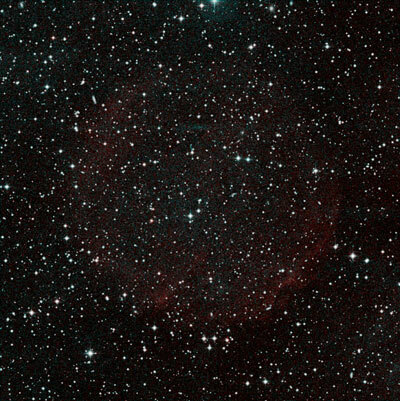 This is again one of these funny red nebula that should respond well to H beta, but don't. 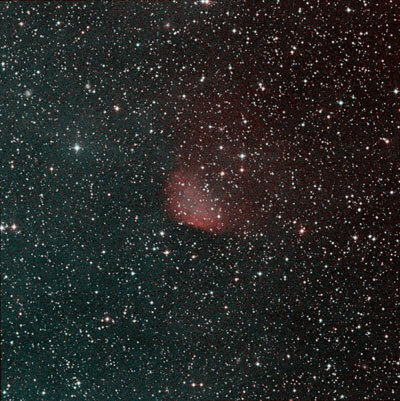 According to Madsen et al., the red color is due to NII, which is about 5 times stronger than H-alpha and 7 times stronger than OIII. This makes OIII the strongest visual line, even that it doesn't look like this. 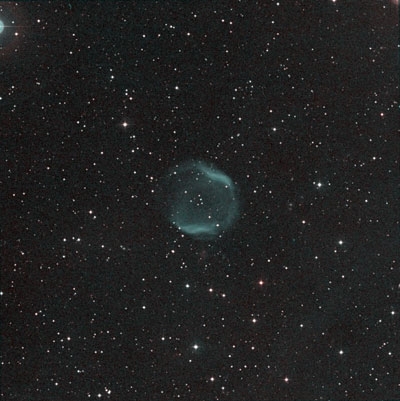 Nevertheless, even with OIII filter, the PN appears only extremely faint, round and featureless. 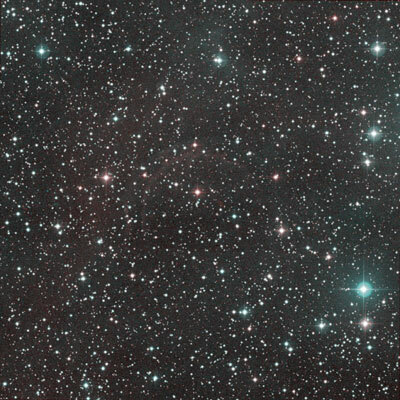 With OIII filter, a diffuse round glow is visible between two groups of stars. Structure appears to be mainly NII with only little contrast to the surroundings in HII (Tweedy and Kwitter and Frew 2013). 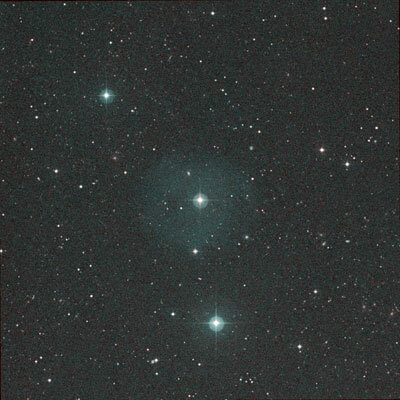 Relatively bright PN that responds well to OIII filter. Appears as a ghostly C-shaped PN that is open toward E with brighter rims N and S.
Around its bright central part (17"x23"), the Cat's Eye Nebula has an outer halo of approximately 5' diameter. The by far easiest part of this halo is a rectangular condensation W of the central part towards a neighboring bright star. 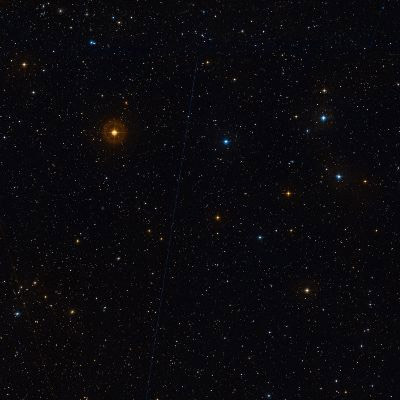 This structure bears the designation IC 4677 and is listed as a galaxy by some charting programs. Even under less than optimal conditions, this part of the halo is a relatively easy object. The small barred galaxy is as well visible and should not be confused with the halo spots .